In December of 2005, I wrote an article on wet shaving. Back then, there wasn’t a lot of shaving advice on the internet — at least none I could find. So I wrote the article with the sincere desire to help others like me, who were having a tough time with disposable razors and electric razors, and with constantly irritated faces and necks. For me, it got so bad at times that my whole face and neck would just bleed from every pore, every time I took a razor to my face. It was crazy. What worked for me then was using a Gillette Mach 3 Razor, because I didn’t know better. I would use a safety razor from time to time, just to troubleshoot where my shaving techniques needed improving. Since then, I graduated to using the safety razor all the time. What helped me improve my shaving technique was watching mantic59‘s videos on YouTube about three years ago. I was really glad to find him again today so I could link to his videos. I haven’t seen them since, and I wasn’t sure if he was still around. Now that it’s been more than a few years since I wrote the original article, I thought I’d update it with a how-to video on wet shaving with a safety razor, where I show how a typical shave goes for me. I shot the video in 720p HD, with the wonderful Olympus PEN E-P2. My wife acted as my trusty camera-woman. Shaving is an art, and it has to be learned. It doesn’t come naturally to us. One’s shaving form must by necessity differ, depending on the type of shaving utensil used: straight blade, safety razor, disposable razor, electric razor, etc. For me, a safety razor is the perfect balance between sustainability and shave quality, and that’s what I’m going to talk about here and in the video. A straight blade is too scary for me. There’s that potential of slitting one’s throat. A safety razor still gives you the benefit of shaving with a sharp blade, but this time it’s contained within an apparatus that won’t let it cut your throat. A disposable razor, whether it has one, two, three, four or five (who cares!) blades, doesn’t offer as good a shave, because it’s less maneuverable, it’s made to be even safer — or in this case, useless — and creates non-recyclable waste, thus polluting the environment. Just think how many blades and handles you use every year — all of those end up in a landfill. They can’t be recycled, because the plastic can’t be separated from the steel. It’s waste that can be easily avoided. 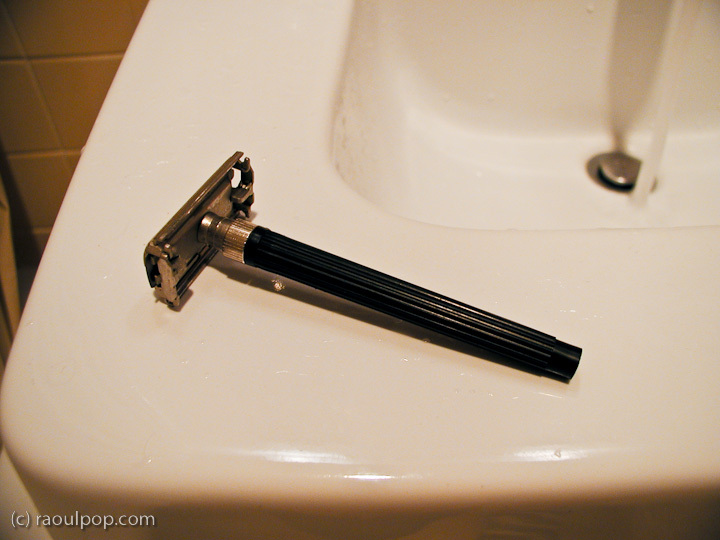 On the other hand, all you throw away from a safety razor is a thin steel blade, which is perfectly recyclable. The razor itself lasts practically forever, which is why the companies that make shaving products would rather you get the disposable stuff. I say consequences have to trump profits sometimes, even in a capitalist society. And, as Cary Grant says in “Mr. Blandings Builds His Dream House”, I like a safety razor because “I prefer the clean sweep of tempered steel as it glides across my face.” Yes indeed, Cary, yes indeed. I hope you enjoy the video and come away from it with a better appreciation for the art of shaving, and with a few tips that will help you get a better shave! I shave with a safety razor or injection razor (if I have blades for it) as the fancy takes me each day. I have always used warm water but picked up something interesting the other day. Despite the standard position of using warm water to soften the beard, there is an argument for using only cold water. I gave it a try and have been shaving with cold water for about two weeks; my experience is that I get a more comfortable shave. Perhaps using warm water to wet and lather the face while rinsing the razor in cold water will be a compromise. I’ve heard that rinsing the razor in cold water makes the metal contract, providing a keener edge. Raoul, that’s easily the most bizarre video I’ll ever find on a photography blog! The quality is awesome though, both video and audio. I’ve had my eyes on the new Fuji HS10, for its versatility. But maybe I should have a rethink. Again. For the millionth time. Are you shooting with a kit lens? Yup, shot it with the 14-42mm MFT kit lens. And the subject of shaving is not so foreign to photography… There’s a clear connection: you often travel to get great photographs, and when you travel, one of the things that’s part of your daily routine is shaving. If you don’t get a good shave, you don’t feel great, and that translates into poor photographs. 🙂 See, the connection’s crystal clear now! Good luck waiting for that… 🙂 Every time I let my stubble get longer, my face and throat itch like crazy. I can’t imagine how much a whole beard would itch, but it would drive me bonkers. Very glad to hear from you, and thank you! Your videos started me down the right path. Shaving was a painful torture for me until I discovered how to do it properly.